The natural wine movement has been one of the most interesting phenomenas to research in all of wine. The story has it all - the rise of craft culture, over commercialization, high profile players, hipsters, mysticism, and even the occult. The insights into the birth, or perhaps the rebirth, of a natural focus and its undeniable momentum in some ways answers to the evolution of the wine industry as a whole. Natural wine as a category is not legally defined, but it has generally come to mean that the wine should be made organically or biodynamically - terms which are legally defined - and with as little human intervention as possible in order to reflect the grapes and growing environment most authentically. Isabelle Legron, Master of Wine and creator of the RAW wine international fairs, states that natural wine is not ‘made’ - rather, grapes are ‘transformed’. This glorious illustration is by Marc Rosenthal for the Wall Street Journal. Practitioners typically forego the use of commercial herbicides, pesticides, fungicides and additives; use little to no additional sulfites than what occur naturally, limit the role of oak, and usually only lightly fine and filter before bottling. Natural wines are often characterized by a hazy appearance for this reason, and the perfumed nose of more conventionally made wine may also be missing due to the use of ambient or naturally occuring yeasts over those that are cultured or lab grown. Cultured yeasts create specific fermentation outcomes that result in desirable and expected nose notes and alcohol levels in finished wine. Nose notes are often earthier and less perfumed, and on the palate the wines tend to be more acidic with lower alcohol levels. Natural wines are usually not meant to be aged for any great length of time, if at all, and even the reds are usually best served chilled. The movement got its start in Beaujolais in the 1970s with the Gang of Four, a team comprised of Marcel Lapierre, Guy Breton, Jean-Paul Thévenet, and Jean Foillard who were inspired by Jules Chauvet, a winemaker and chemist who Kermit Lynch once referred to as a ‘viticultural prophet’. In later years Joseph Chamonard joined the group and it expanded to the Gang of Five. True to Chauvet’s teachings, the Gang discontinued use of herbicides, pesticides, and fungicides in the vineyard and made wine from grapes grown on older vines, harvested later to allow for longer hang time and riper fruit. They used little to no sulfur dioxide, carefully sorted grapes prior to pressing, and forbade the addition of sugar to fermenting juice to increase sweetness and alcohol levels, a practice which had become commonplace. Whereas today many of these practices are mainstream, at the time they were widely disregarded (‘a lot of snickering went on behind the hand’ stated one winemaker in Morgon), particularly around the limited use of sulfites, a topic that remains misunderstood and divisive. Sulfites are used as stabilizers. They occur naturally, but are also added to harvested grapes and to fermented must to avoid bacterial overgrowth and to prevent refermentation, but many consumers claim to suffer from sulfite allergies. Sulfites are measured in parts per million, or ppm, and at least one wine scientist with whom Winelala spoke states that histamines in wine are a bigger cause of headaches than sulfites. Used too liberally, sulfites can mute the taste of wine by making it to ‘orderly’, according to Steve Nuttall, wine expert at The Reliance pub in London, but generally winemakers seem to agree that some dose of sulfites must exist to keep wine from spoiling - just not “unnecessary amounts” says Jean Folliard , one of the original members of the Gang of Four. As the Gang continued to hone their practices away from the commercial spotlight, the use of herbicides and commercial yeasts became excessive in France by the 1980’s after industrialization began following World War II. Simultaneously, the industry saw the rise of Michel Roland and later Emile Peynaud, two of the world’s most famous oenologists whose influence extended to their hundreds of clients across the globe. While their guidance undoubtably raised wine quality standards by emphasizing input and processing hygiene, better temperature control, and the use of lab analysis in soil and grape components, they were also accused of creating an industry whose products were too homogeneous. Robert Parker, creator of the 100 point wine rating system, also arose from this era. Parker’s taste was so influential that some winemakers were accused of catering to it order for their wines to receive higher scores (and therefore command higher prices). Bruno Prats of Chateau Estournel, in response to this ‘internationalization of wine’ Estournel sardonically stated in 1993 that there were ‘no bad vintages left’. ‘Organic wine’ and ‘wine made with organic grapes’ are two different classifications. Truly organic wine means that the classification pertains to the whole winery; all the land under vine, all winemaking practices, and all inputs into the wine, while wine made with organic grapes pertains to the grapes and vineyard treatments only. Biodynamic winemaking views the vineyard as an ecosystem made of up interdependent elements that must be tended to in harmony with the spirit of nature. It is based on the teachings of Rudolph Steiner, an Austrian occultist who posited that agricultural practices should act ‘as cosmic antennas to the soil raying back whatever is life giving and astral’. Biodynamic farming involves different vineyard treatments that are some combination of organic material and animal proteins buried underground for a winter, unearthed, diluted, and sprayed back into the soil. The biodynamic calendar is organized into root, leaf, flower, and fruit days as well earth, water, air and fire signs, and offers advice accordingly. It has been said that finished wine should only be consumed on flower and fruit days. 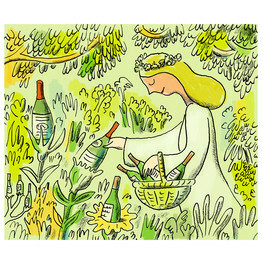 Each country has its own governing body that provides standards for sustainable, organic, and biodynamic certification. Demeter holds the trademark on the term ‘biodynamic’ and certifies wines by country (ex: Demeter USA) with their seal. Spain, France, and Italy account for the 79% of the world’s organic vineyards. Chateau Palmer in Margaux uses biodynamic practices and its executive board predicts that all of Bordeaux’s first growths will convert within the next decade. Domaine Romanée Conti in Bourgogne also follows natural wine principals, although they did not bother applying for certification. In the New World, 98% of New Zealand’s and 95% of South Africa’s vineyards are certified sustainable, and both countries are working toward a goal of having 100% sustainable vineyards, with organic certification in sight as the next step. Chile, the US, and Argentina are producing more and more organic wine. Calculating the exact market share of natural wine is difficult given that the term is legally undefined, however Prowein, the annual international wine trade fair, estimates that organic wine made up about 5% of the market in 2016 (keep in mind these wines may not necessarily classify themselves as ‘natural’) while Beverage Daily, an industry trade publication, estimated that organic wine comprised a 3.6% share of global consumption. Both trade bodies posited that the natural wine sector would make up 5% of the global market by 2020. Beverage Daily projects that one billion bottles of organic wine will be consumed each year by 2020, having grown from 349 million bottles in 2012. The phenomena that humbly began in Beaujolais, that wove in esoteric practices from the Loire Valley, then traveled to hipsters in London, Japan, the US, and across the world, finally to appear in a restaurant on the highest echelon of gastronomic experience as an answer to industrialism, commercialism, and homogenization, continues to move forward. The movement is resonating because in many ways it is a correction. This may have been what Robert Parker perhaps subconsciously inferred when he mentioned a profound balance.